Where Can I See Cranes? A short video with Nigel sharing the rearing process of the young cranes at WWT's Crane School with fantastic footage of crane chicks. Extra PE lessons are being given to a common crane to help him keep up with the rest of his classmates. 'Lazy Larry' – as he has been nicknamed – stands out from the 24 birds being brought up at Crane School 2010 as he seems to lack a bit of get up and go. Today we managed to catch some video footage of this crane chick's first steps after it had hatched. Just a few short hours after an epic 17 hour road trip from Germany the first eight crane chicks have successfully hatched at the special crane rearing facility at WWT Slimbridge. Only hours after arriving the first chick hatched, followed by seven more, to the surprise and delight of me and crane ‘mummy’ Amy who had been anxiously awaiting their arrival at Slimbridge. 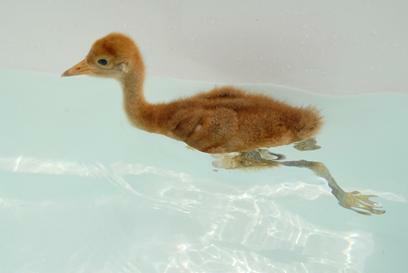 The next few days should see more chicks hatch at WWT Slimbridge. But in the meantime, you can share with us the special moments when the first cranes hatched! ©2019 The Great Crane Project. A partnership between WWT, RSPB, Pensthorpe Conservation Trust and Viridor Credits.